I ordered this recently as an early Christmas present for myself. I'm not familiar with the author or her bakery, but I LOVE to bake. And this one looked cute. 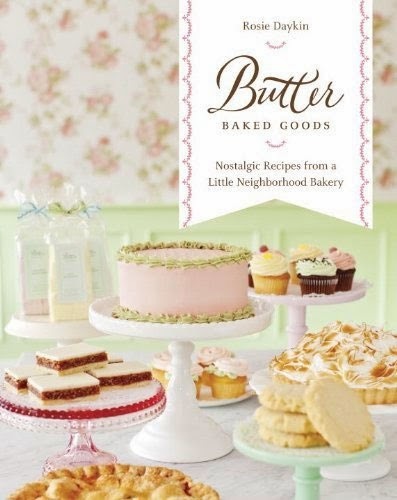 Little did I know I would be receiving a gorgeous hardbound baking book that I would be proud to show off. There is a wide variety of recipes in this book. Everything from scones and muffins to pies and cookies is here. There aren't a ton of any one type of recipe, but what is here is definitely appealing. Most of the recipes are easily accessible for the average home cook. Only a few are the least bit fussy. And I only found one ingredient that I could not source locally: pistachio paste. Which isn't a problem for me, because I'm really not all that fond of pistachio. Butter's claim to fame is the homemade flavored marshmallows. I've seen homemade marshmallow recipes before (Ina Garten has one) but I haven't seen flavored ones. The main recipe for marshmallows also features several variations including raspberry, coffee, mint, and coconut. Given the techniques, you can easily swap other flavors in where you want to as long as they're added in the right part of the recipe. For those who are new to frosting techniques, there are also several pages of ideas and instructions. Even though I've been making buttercream since childhood, there were other frosting recipes and ideas that I haven't tried yet: especially the boiled icing aka Marshmallow Fluff icing. If you want to get all fancy-pants, she even has recipes where you can toast the tops like a lemon meringue pie using a kitchen torch. You don't have to, though, and that's what I love. Be as fussy or unfussy as you like. As for the cookies, my particular favorite baked goods to make, those are divided by cookie type. The rolled and shaped cookies have their own chapter, as do drop cookies and bars. And for nearly every cookie recipe there are instructions for how to store the cookies and how long they'll last (sometimes in the fridge, sometimes in the freezer). What surprised me most about this cookbook was the quality and detail that went into the book. The endpapers are done in a rose wallpaper style. There is a satin ribbon attached to the binding which acts as a built-in bookmark. There are photos of every recipe. Every little hint to getting these recipes to turn out is included right down to the equipment you'll need. 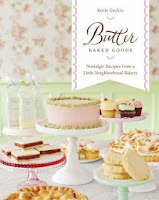 If you're looking for a beautiful, impressive book for the baker on your list, this is the book to get. It is special, the recipes are diverse, and it is reasonably priced, even at full retail. Too often, the books at that price are disappointing, but not this one!